The fascination of 78rpm gramophone records is hardly on the wane, the number of enthusiasts is increasing permanently. Good that you have found the way to schellack-plattenshop.net. Rummage in our offers, and - maybe - the one or another title will let your mind travel back to your childhood or youth. Or you remind great voices, famous conductors and interesting compositions of the past. Devoid of the shellac record they would be only names and terms without deeper content and significance. Gramophone records are timeless and will exist for decades, when compact disks are destroyed long since. Emile Berliner, born in Hanover, Germany, and emigrated to the United States in 1870, applied in the year 1887 for a patent regarding a discoid sound storage medium in which was carved a spiral groove. He called this disk "Schallplatte" himself. 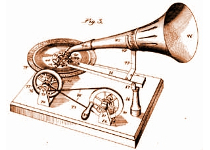 A further component was a recording and playing apparat too (the so-called "Coffee mill"), the forerunner of the gramophone. A grandious marketing effectiveness had a logo which is based on the following story: The English painter Francis Barraud cared about the dog "Nipper" of his late brother. When he played his phonograph at times he could notice regularly that the dog listened attentively ahead the machine. So the idea came to paint this situation. Barraud offered the painting to the "Edison & Bell Phonograph Company", but they refused. Now he went to Berliner's "Gramophone Co." Whose director Owen told him that he was interested if Barraud painted the dog in front of a firm gramophone. 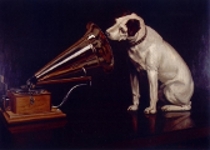 In September, 1899 the picture was finished and was bought - together with the slogan "His Master's Voice" for the amount of 100 pounds. No doubt, this logo carried the support of gramophone records enormously, because it stood for high fidelity.